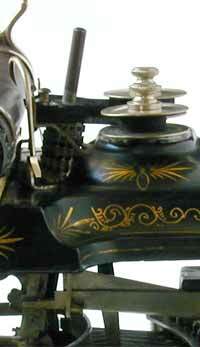 The Crandall New Model is one of the most impressive machines in typewriter history, if only for its appearance. 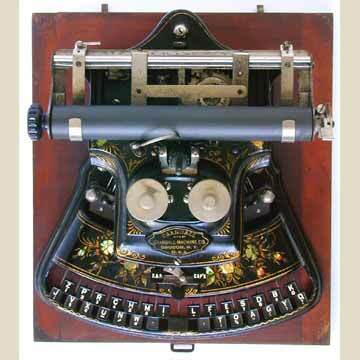 The machine was invented by Lucien Crandall, who patented his first typewriter invention in 1875. In 1879 he was granted a patent for a downstrike typesleeve machine, much like the one that was finally introduced in 1884. The New Model that appeared in 1886, and that is presented here, is one of the most elaborately decorated machines in typewriter history, apart from the very first Sholes & Glidden. (pic 6). Particularly notable is the use of mother of pearl. The upright type sleeve was the first in its kind. The Crandall was the first typewriter using a single element typesleeve, that turned into position when a key was pressed, similar to the later Chicago and the much later and much simpler Mignon index typewriter. The Crandall was quite a successful machine. The serial number of the machine presented here is 17705, and two later models were produced also. However, only very few Crandalls seem to have survived. The machine is very rare today.